Eating sufficient calories for cycling should, in theory, not be too difficult, but in practise it is easy to get it wrong. It is surprisingly easy to ‘forget’ to take on enough energy. But, at the other extreme you can try to take on too much in a short space of time – food the body can’t digest leaving you just a bloated stomach. It is not just amateur cyclists who struggle to get the calorie intake correct. I’ve heard many coaches of pro-teams say one of the hardest things is to get Pro-cyclists to eat and drink in sufficient quantities. I’ve heard many times Director Sportives say of a pro-cyclist – he’ll be fine so long as I can get him to eat and drink. The problem is that when you’re racing, it can feel like an effort to eat and drink. On a personal note, I’ve often messed up 100 mile time trials (4 hours) because I didn’t take the correct levels of energy / drink. This post is partly for my own benefit. The maximum rate of carbohydrate consumption per hour is 60-75 g.
This figure is very important as a rough guide to how much you should eat for long rides; you want to be aiming to keep a constant carbohydrate intake around this figure. If you are taking more, e.g. 100 grams +, you will just get stomach problems because you can’t ingest it all, the food will be sloshing around your stomach, making you feel bloated / sick. If you only taking less – e.g. 20 grams or less, you are under-fuelling and more likely to run out of energy and end up with the dreaded ‘bonk’. It does requires discipline to actually take what you need. When racing, you may not feel like drinking / eating, even though you need to. You can’t rely on the normal hunger / thirst indicators. Sometimes, you can just feel too exhausted to reach for a drink. In a Timetrial you can get stuck in the aerodynamic position and not want to move around to get food. Twice in a 100 mile race, I didn’t stop to pick up a third bottle because in the racing mindset I didn’t want to lose 5 seconds picking up a bottle. But, I ended lost a few minutes because I took on too little energy. Don’t do something in a race, you’ve never done in training. e.g. don’t suddenly drink litres of fructose / glucose energy drink if you’ve never done that before. Your stomach may not like it! You don’t want to find out in a big sportive / race. Remember there’s a big difference between a steady four hour endurance / training ride and racing for four hours. The calorie consumption increases significantly the more effort you make. You might survive a steady training ride on little food, but if you race hard, the energy consumption will be significantly greater. How many calories do you burn when cycling? If you are cycling steady, you may burn 500 an hour. If you are cycling hard, close to threshold, you can get close to burning 700 – 1,000 calories in an hour. Another table showing calorie consumption depending on weight. How much Carbohydrate can you absorb? 65-70 grams an hour. Studies suggest that we can absorb around 60-75 grams of carbohydrate an hour. The limiting factor is the intestines ability to absorb carbohydrate. Fibre reduces carbohydrate absorbed. Bear in mind, that if the carbohydrate source has substantial fibre, we will lose some of this carbohydrate source. This is why liquid energy sources (gels, drinks) are more efficient and more easily absorbed. Fructose – Maltodextrin. Some studies suggest that the rate of increase can be higher if we mix different sources of carbohydrate e.g. maltodextrin and fructose. 2:1 energy sources (2 parts maltodextrin and 1 part fructose are quite popular). But, bear in mind overloading intestines with fructose can cause it’s own digestion problems. How many calories in 70 grams of carbohydrate? 1 gram of carbohydrate = 4 calories. Therefore, 70 grams = 280 calories per hour. How much carbohydrate is stored? Clearly, if you can only take on board 280 calories an hour through carbohydrate consumption and you are burning 800 calories through cycling, you need other energy sources. Fortunately, the body stores energy through – glycogen which can easily be converted to sugar and also fat stores. For an untrained athlete, glycogen reserves may be 100 g of glycogen in the liver, whereas muscle is able to store about 280g. For trained athletes who make conscious effort to carbo load, these glycogen reserves can be increased. However, many cyclists don’t usually have time to go through the process of carbo-loading, except for those targeting specific events. How much to eat during a cycle ride? For a 1-2 hour training ride, it is not really necessary to take on board carbohydrate. You can make use of the carbohydrates (glycogen) which are already stored. For these rides, you can also train to make more efficient uses of the fat burning energy sources. I would only take an energy drink during a 1-2 hour ride, if it was a race or very hard interval session. For an endurance ride, it is not necessary. I would rather not rely on an energy drink, but improve the efficiency of fat burning energy sources. During a three hour ride, the natural carbohydrate reserves will be exhausted, and therefore, it becomes more important to consider energy sources and start taking on board energy from the first hour. One target could be 3* 50 grams = 150 grams. This equals 1.5 litre of energy drink, plus one or two energy gels or energy bars. For four hour plus rides, the aim is to keep to that maximum carbohydrate target of 60 grams. Food intake may get harder the longer you go on. Don’t wait until you’re hungry start taking on energy from first hour. You might taken on board 45 grams through energy drink (700ml an hour), requiring one energy bar / gel extra per hour. For longer than four rides, I would be more likely to take on energy sources other than just carbohydrate, but include easily digestible protein and even some fats. For very long rides, it becomes better to mix energy sources and not just rely on one product. The stomach may tolerate sweet energy drinks for 2-3 hours, but after that it might welcome some non-sweat energy sources like fig rolls or malt bread. 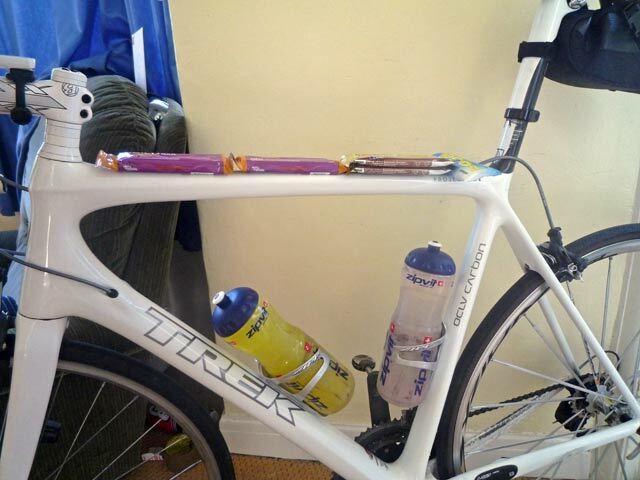 On long rides, I like to take a variety of energy bars, a few (expensive) power bars, plus cereal bars from supermarkets. I may also take a few raw seed/fruit bars for variety. For six hour rides, I might start off with a bottle of fructose/glucose, and move onto pure maltodextrin. Ideally the last bottle might be maltodextrin / protein to help recovery. The temperature will make a big difference to how much water you need. This can alter how you take in energy. One 100 mile race, I planned to drink 4 * 750ml energy drinks to get all my energy from them. But, it was really cold, and I ended up losing 5 minutes – having to stop in the bushes to get rid of all that excess water! You know the theory of how much energy you need. But, on the big day you can forget to implement the basics. For long rides, you need to start thinking about eating and drinking from the moment you start. National 100 mile 2005 – I had three water bottles on bike. But, one fell out going over first pothole. I never stopped to pick it up. Moral – never try a water bottle holder for the first time in a race. National 100 mile 2010 – 2* 750ml energy drinks. 1* energy bar – very hot – ran out of energy big time. West district 100 mile 2010 – after dehydration in previous 100 mile, I take twice as much energy drink, but it’s 15 degrees cooler – big mistake! National 100 mile 2013 – I did try a bit of carbo loading. But, during race I took on – 2* 750ml energy drink + 1 energy gel – 160 grams of carb taken – out of a possible 240 grams for a four hour ride. Also a bit dehydrated at the end. It wasn’t a complete disaster. I finished 5th in 3.46. But, it was a good job the last 8 miles were downhill with a tailwind! Looking at past races, I would have benefited by being more disciplined in taking on energy. During training rides, I don’t make this mistake. But, in races, I have taken on insufficient – relying too much on stored energy and hoping the last 10 miles you can get by on empty. I’d been thinking of writing this post for quite a while, and got one or two tips from ‘Faster‘ by M.Hutchinson, last week. Thanks Tejvan, a very informative blog today, not that it isn’t always informative. What about consumption for winter base miles, eat the same as here or eat less to train using fat as a fuel? Personally, I would eat the same. What about consumption around Hill Climb events at the thick end of the season? Does much change and do you have anything specific before your effort? Does the type of hill influence anything? Also, what are you thoughts on caffeine? Before short hill climb, you don’t really need any specific energy requirement because the effort is so short 3-30mins max. I take some energy drink / gel an hour / 40 mins before hand, more out of habit than anything. The main energy requirement for hill climbs is not to eat a big piece of cake, just before you race, because you will be sick 🙂 so don’t eat anything big for 3 hours before, but keep energy topped up with small amount of carb drink. Caffeine? I sometimes have a gel with a small / standard dose / (e.g. 1-2 shots of coffee). Sometimes I have gel without. It doesn’t make much difference. I’ve never wanted to take more than one unit of caffeine a day. Taking ‘large quantities of caffeine, e.g. proplus tablets feels too much like doping, even if it is legal. I’ve never tried that. Tejvan do you no how many calories are in a large boiled egg?